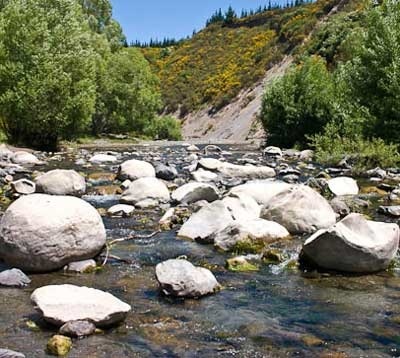 Using sedimentary rocks from the bed of the Waipara River in North Canterbury, an international research group led by GNS Science palaeontologist Chris Hollis has reconstructed ancient sea temperatures. They found surface sea water exceeded 30 degrees Celsius, and water at the sea floor hovered around 20ºC during an episode of greenhouse gas-induced global warming that lasted for between two million and three million years. “These temperatures are at the extreme end of modern tropical water masses,” Dr Hollis said. Year-round sea surface temperatures of 25ºC to 30ºC are today found only at the equator. At the time, New Zealand was much closer to the South Pole — below 50ºS — yet supported tropical flora and fauna. (GNS press release here). The Eocene and the associated Palaeocene Eocene Thermal Maximum (PETM) are interesting to climate scientists because at the time the world was in a warm greenhouse phase, and the PETM saw a burst of rapid additional warming associated with the injection of massive amounts of carbon into the atmosphere (possibly methane from hydrates). Modeling the climate of the time poses a few problems, however. Temperature reconstructions show that the Arctic was very warm (ice free, with crocodiles) but it’s difficult to get the models to reproduce that without driving tropical temperatures up to over 40ºC — and that should have caused a massive die-off that is not (yet) seen in the fossil record. New Scientist had a very good article discussing Eocene climate reconstructions earlier this year (not behind a paywall, thankfully). To us, this suggests that the earth’s climate is much more sensitive to changes in greenhouse gas levels than is allowed for in climate models, which appear to be underestimating the degree of warming. Extreme greenhouse warming either caused high latitudes to warm far more than low latitudes or equatorial regions warmed beyond the limits of life: above 40ºC. Another piece in the jigsaw puzzle of climate reconstructions for the period, made the more interesting by coming from my back yard. I live on a small farm above1 the Waipara River where Hollis and his team conducted their fieldwork. This section of the Waipara is world famous in New Zealand (to palaeontologists and geologists, at least) because of the fossils found here — marine dinosaurs, penguins, sharks and concretions much like the Moeraki boulders (click on the thumbnail to see “God’s Marbles”, a few km upstream from us) — as well as the extensive faulting2. Generations of geologists from the University of Canterbury have done fieldwork or enjoyed field trips here. It’s also scenically beautiful, and I’ve become involved in efforts to protect and enhance the whole river environment. The Hollis et al paper was given advance publicity to draw attention to a conference, Climatic and biotic events of the Paleogene in Wellington, which includes a public Greenhouse Earth Symposium at Te Papa on Jan 14th. I’d love to be there, but when I contacted Chris to discuss the paper, I stumbled on the next best thing: the pre-conference field trip is visiting my neck of the woods on Tuesday. My chance to meet the experts, while they examine “the siliciclastic mid-Waipara section, containing a bioturbated K/T boundary and an Early Eocene record of tropical conditions”. I’m looking forward to it (thanks for the invite, Chris). We went out in the pouring rain and freezing wind, dodging mad sheep, to find some rocks. When we did, I hit them with my big hammer. From this we deduced that we needed more money for a big expensive machine that goes ‘ping’ in order to obtain some real data. The rest of the year was spent writing (unsuccessful) grant proposals. Every geologist needs a big hammer3. The article in the New Scientist which you link to above is, I’m happy to report, not behind a paywall as you feared. It’s certainly a good read. The new results on tropical convective clouds are discussed here. KE et al’s recent paper on increased TC activity in equable climates is here. Well, it turns out there are competing hypotheses, as many as three. Life and nature being complicated, they don’t look to be mutually exclusive. Modeling them may pick a winner, though. My metaphorical money’s on KE. There is abundant evidence that during periods of equable climate in Earthâ€™s history, such as the Eocene, the interiors of continents at high latitudes were exceptionally warm during winter. Land has a low heat capacity and distances of thousands of kilometers separate some continental interior regions from the ocean. Consequently, significant increases in ocean temperatures do not necessarily imply that temperatures in continental interiors will increase enough to explain proxy data. As a result, explaining winter warmth deep in the interiors of continents remains a central outstanding problem of equable climate dynamics. Here we present new evidence from global climate models (GCMs) that increases in cloud radiative forcing and the condensation of moisture (convergence of latent heat) over land may play central roles in warming continental interiors at high CO2 concentrations. We show results from both the NCAR CCSM coupled GCM run in Eocene configuration and the NCAR CAM atmospheric GCM run in modern configuration at various CO2 concentrations ranging up to 2240 ppm. The increases in cloud radiative forcing over land may be associated with a novel high-latitude convective cloud feedback that has recently been shown to produce significant warming over the ocean and help reduce sea ice cover at high CO2 levels, and the increased latent heat transport appears to be mainly zonal, rather than meridional. Thanks Steve. Sounds complex to me!